Dan is a "backyard mechanic" who has always done his own auto repairs whether on motorcycles, boats, cars, or even motorhomes. 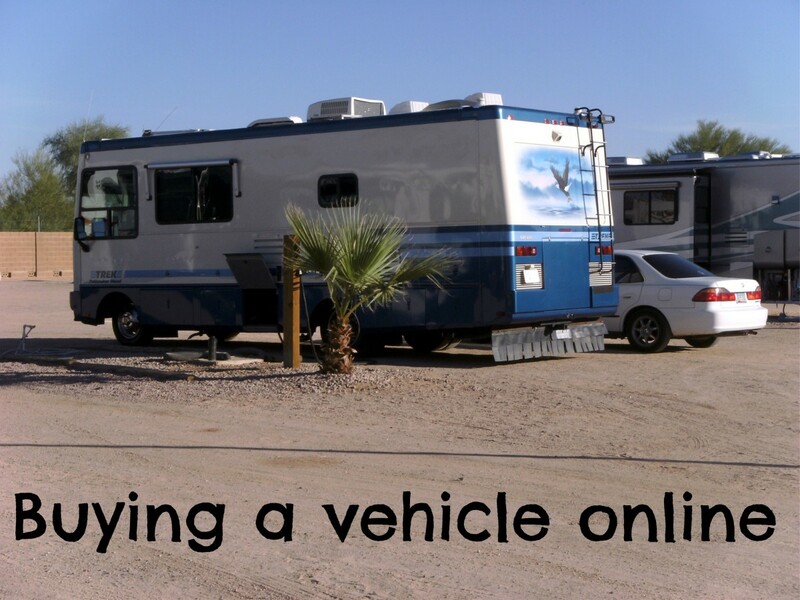 Let me begin by saying that the title to this article is a trifle misleading; my wife and I actually bought an RV online rather than a car but the principle is the same, as are the pitfalls and rewards. With that in mind, this article is a report of our personal experiences, problems and success of buying a vehicle online, along with some strong suggestions of what to look for when making such a purchase. We had sold our older motorhome and were in the market for a newer model but the particular model we wanted was not available anywhere in our area; to find what (we believed) we wanted would require that we step outside our comfort zone and buy online from a remote location far from our home. There will always be some risk in buying online, and more when the purchase is far from home. We had decided that we wished to buy a Safari Trek motorhome, which has a floor plan decidedly different from anything else on the market. The problem was that there was absolutely nothing in our area that we could look at and inspect to see if it was what we actually wanted. We've owned two motorhomes in the past and had some idea of what we wanted in the mechanics and amenities, but this one was far different than anything we had ever owned or seen. We had a decision to make, then, in what we were willing to risk. Once a deal is struck and money is paid, it is likely to be impossible to change your mind when a vehicle is seen in person. We made a $1,000 down payment and spent $500 in airfare before ever seeing our new rig - a good deal of money to us and something we could not reasonably hope to recoup if we didn't like it. In addition, there are scammers everywhere on the net and it is entirely possible to have your money disappear down a black hole, never to be seen again. There are steps that can be taken that will go a long ways to eliminating this possibility (more on that later), but it will always exist and you must be willing to take that risk. If it is a matter of life and death that you buy a vehicle, best accept a more expensive but local deal. In our case, the loss of the purchase monies and RV would put a stop forever to dreams of touring the country during our retirement, but it would not cause us to lose a job, go homeless, or hungry. With all the precautions I could think of, it became a risk that was acceptable to us. There are two basic types of scams out there, and they are very different. The first is a seller that represents the vehicle as something it isn't. A car with low mileage and excellent condition, for instance, that has 150,000 miles on it and is ready to fall apart. Pictures that are carefully taken (or photoshopped) but somehow miss that big patch of rust or dent in the back fender. A description of tires as being in good condition, and so they are - for the next 500 miles, whereupon they all need replaced. Understand here that buying any used vehicle is a risk - relatively few have a warranty and any one of them could blow an engine ten miles down the road. The difference here is that the scammer knows the vehicle has problems, but won't divulge them and you can't see them until it is too late. The solution here is to have the vehicle inspected unless you are very trusting of the seller. While I'm assuming that the vehicle is too far away to inspect yourself, there are other options. We found one RV that was 1500 miles from us, but only 20 miles from where my brother lives - a person I would trust to look it over for these kinds of things. If possible you can use this method, but if not any larger city will have companies that specialize in such inspections, for a fee, and that fee is usually not exorbitant. For a motorhome it usually runs between $100 and $200; cars are generally cheaper as there is far less to inspect and check. The second major scam is a "seller" that is only too happy to take your money, but has no vehicle to sell you. This one be even more damaging, especially if you have been foolish enough to send the entire purchase price before picking up the car. While some of the techniques are the same, dealers and individuals use somewhat different ways to convince you to send money so lets break this one down a little further. 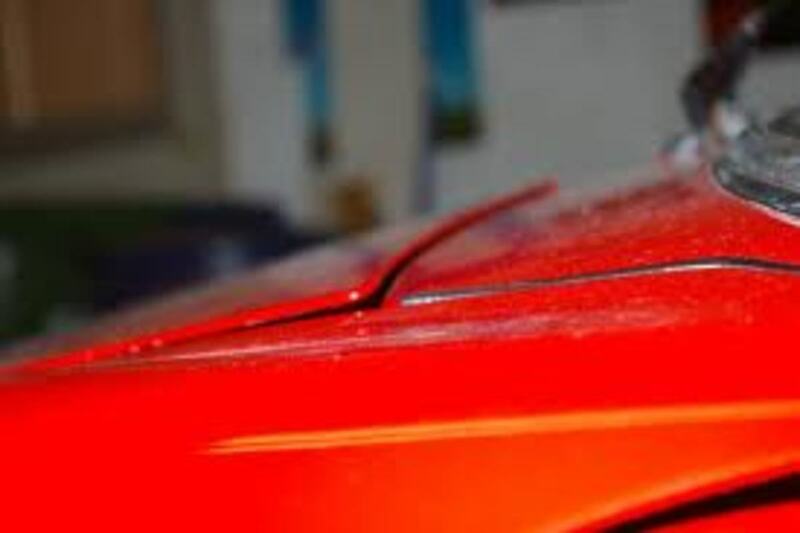 Although dealers will sometimes misrepresent a vehicle as noted above, the answer is an independent examination of the vehicle and any dealer that will not allow that should be avoided at all costs. Don't let them feed you bogus reasons not to do it, either get it done or find a different car. 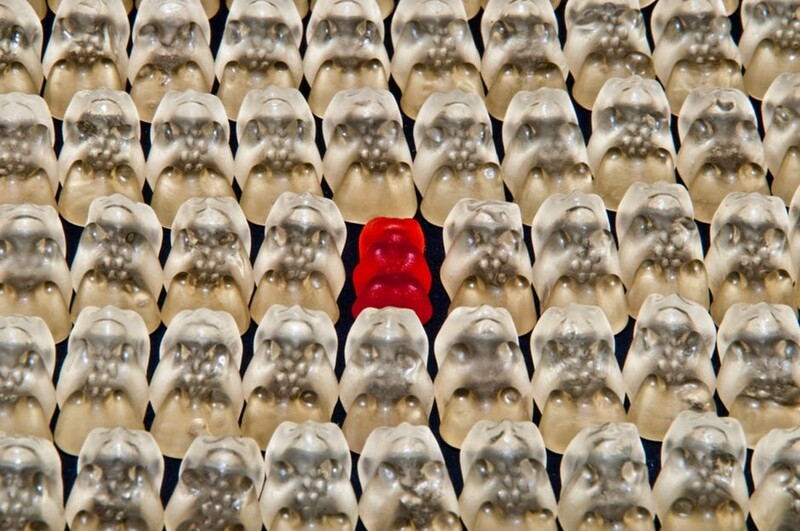 The bigger problem is an individual that is representing themselves as a legitimate dealer, and this is a little more difficult to detect but still possible. There are a variety of things that you can look for to find out if the ad is totally bogus or if it is from an actual dealer, and some will even give you an idea of the quality of that dealer. When we first found the ad for the RV we eventually purchased a call was made to the dealer for more information. A secretary took our call, asking where to direct us to, and that was the first sign - there were at least two people involved. Few thieves will operate with partners, although there are some that do. After gathering all the information we could about the vehicle, I hung up and began looking for information about the dealership itself. The online white and yellow pages both listed the same phone number - another good sign as the number listed in the ad was a legitimate land line number, with the correct area and city codes (never trust either phone numbers or links given by the seller). The dealership had a nice looking web site, and that adds at least a little bit of confidence. The Better Business Bureau for the city listed them, with no complaints, as a long time member. They had posted several sales videos on youtube, selling several different rigs, and one was over a year old - if it's a scam it had been going on for a long time. I found their address in a half dozen locations, all the same. All of the various RV's they had for sale were at the same address, and it was a physical address, not a PO box. Google Earth showed something similar in satellite photos as the picture on their website did, and something that was reasonable for a good sized dealership. While none of these were absolute proof I was dealing with an actual dealership, adding them all up made a pretty strong case and I moved on to the question of whether it was a quality dealership, or one of the many out there that are selling overpriced junk. For this I tried to pick up on small hints from everywhere. The testimonies or reviews on their own website are worthless (they won't publish bad reviews for obvious reasons but will make up their own reviews) but there are still comments and words that you can pick up on. The salesman in their videos mentioned that the dealer did not have "fix it uppers" for sale - that all of their RV's had been carefully gone over and everything worked. A good sign, as many dealers are willing to sell vehicles that need some work, particularly in the form of an RV. It needs new carpet, or tires, or the refrigerator doesn't work well, but this one at least stated that they won't. They also won't attract the buyers that want that kind of rig, and will lose some business as a result. The dealer requested a $1,000 deposit - on the high end, but still acceptable - and they took it via credit card. Few scammers will be able to accept a credit card, and if claims are made against those charges often enough the dealer will lose that ability as well. I had planned on flying in (they offered to to pick me up at the airport and provide a loaner car) and leaving the same day, but the salesman requested that I spend the night there, staying in the motorhome on one of their three campsites. In that manner I could meet with their mechanic the next morning with any questions or problems. I was told to expect a two hour walk through with my new rig - they will take the time to explain everything about it. Although the dealer preferred a wire transfer of the remaining purchase price, they were willing to accept a cashiers check when I arrived, given that they had a copy of it a couple of days prior to check that the funds were available (and that it wasn't forged, although they didn't say that); a very reasonable request. All of this made very good sense, particularly the last bit about full payment. This dealership was as aware as I am of the scams out there, and will protect themselves. A true scammer doesn't care as there is nothing to protect, and even a "junk" seller stands to lose what little value they have in their vehicle if your payment is no good. That they care enough to protect themselves, while recognizing that I will do the same, is promising. The "map" below is of the location of the dealer we were working with, centered in the photo. It can be expanded, but plainly shows the proper address, with several large vehicles on the lot. Behind the office area is a large building with more vehicles, and blowing up the picture shows what appears to be a place to park 3 RV's and hook them up to electricity. Google earth can also provide such a photo, and one that is easier to manipulate and look around from different viewpoints. 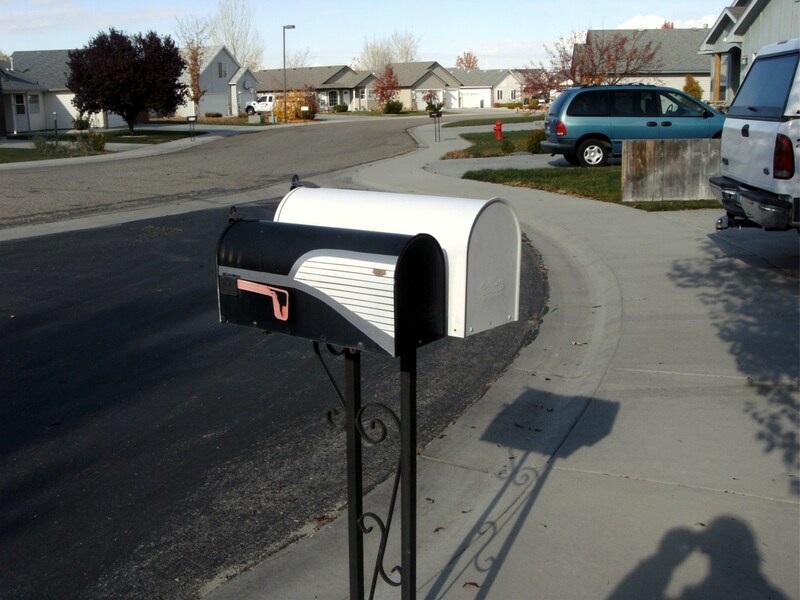 I highly recommend inspecting such photos if you are working through a dealer; one dealer address that I looked at plainly showed a mail drop; a small store of nothing but mail boxes. Needless to say that one was quickly dropped from any consideration. Several of the ads we found, particularly on Craigslist, were virtually duplicated in several different states, all at the same time, and all listing that particular state as the location of the vehicle. People will often post multiple ads over a several hundred mile radius, but when the same ad shows up in Los Angeles and Omaha there is an obvious problem. Similarly, we found private parties that were posting the same picture as dealers; they had copied just the picture and made their own ad. Stay away from these and anything like them. Scammers will very often offer a vehicle for sale, citing a spouse's death, medical bills, transferred overseas, etc. as the reason for an unreasonably low price. It is very seldom true, especially if it is combined with whining that the money is needed immediately. Remember that anyone truly desperate to sell can always sell to a local dealer, and for more than half the cars wholesale value. 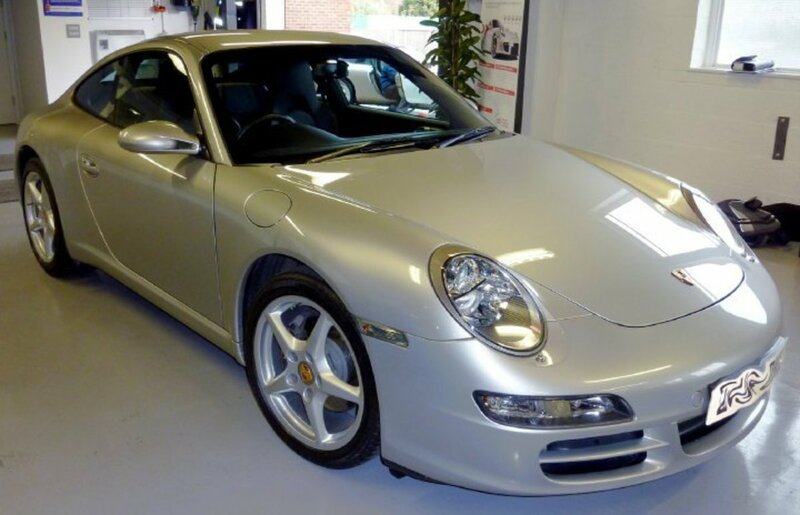 An offer to sell a vehicle in pristine condition for half of what everyone else is asking is stupid of the seller; don't be so silly as to believe whatever they say. Again, they can get more than that from a local dealer. A reasonable wholesale price might be OK - half that is not. My son purchased his car online from someone that was being transferred overseas, but the price was higher than the seller could have gotten from a wholesaler and was a small indication that it was a legitimate deal. Many scammers request a Western Union transfer or other method that cannot be traced. These are all scams and once more something to avoided at all costs. No matter how good it sounds, it isn't true. A good one we ran into was an offer for just about ½ the value of the rig. It was a local Craigslist ad and I was willing to drive 200 miles to just look at one so I emailed, hoping it was be a typo ($23,000 instead of $13,000), asking where and when I could inspect the RV. The reply came back that her husband had died, that she didn't know how to sell a car, and that payment would thus be through a third party that would protect us both. Well, the red light immediately began to flicker, but I once again asked when and where I could see it. Another reply, this time with an explanation that payment would be through Amazon Payments (link provided) and that she really needed the money. I was never provided with a location or phone number even though I'd asked twice for both. The link took me to Amazon Payments, all right, but a bogus one. It looked right, but the URL was just slightly different from the one I got without using her link. Had I sent money there, or even provided passwords or bank account I would have lost at least the money I meant to send, and possibly far more. Instead I called the FBI. This is the key to buying from private party; assume that it is a scam and protect yourself accordingly. Never, ever send any more than a token "down payment" (say, a couple hundred dollars) for any purchase. Deliver the money yourself when you pick up the car, and even that is touchy - see the next section on payment. Never pay for a car that is to be shipped to you from a private party. If you make a down payment and it takes a week to get to the car's location, figure that there is a 50-50 chance it will already be sold and you are out a roundtrip airfare. Many ads do not supply a phone number, and that is alright, but an email to the seller must generate a phone conversation, not just a written description or request for money. If you can't talk to the seller personally, it is a scam. Many sellers will not meet at their home. I understand the caution and sympathize with it, but will seldom buy from someone that requires a different location to meet at. Particularly when spending thousands of dollars I want to see an address (not be told one). At the time of sale, I want positive identification (do they actually own the car or is it stolen?). Consider the source of the advertisement; Craigslist is a known hangout for thieves, while eBay offers a little protection and is a little better at screening sellers. A newspaper ad is probably legitimate, while a blog or forum post may well be a scam. In general, I would not buy long distance from a private individual's ad on Craigslist. Local, yes of course, but not long distance and many of the other sources of advertisements are the same way. There are some major do's and dont's here. Never carry cash to a private sale, and never carry cash if you're flying or driving long distances to the seller - it's an invitation to a robbery. Never pay via Western Union. Always get a receipt or bill of sale and a signed title. Credit cards are useful and PayPal can offer at least a little security, although not much. I have now purchased a car, an RV and have assisted my son in buying a car online. My own car required financing; that was arranged locally without finalizing the loan, and the loan papers finally signed and the dealer paid at another branch of my bank in the city the car was in. My son was able to visit a branch of his own bank local to the seller to get the cash. This time I carried a cashiers check after faxing a copy of that check to the dealer ahead of time. There is never a reason to carry cash to a seller, particularly a private individual. Some sellers won't accept even a cashiers check as it is not uncommon for them to be forged. I'm one of those sellers, having sold 3 cars online, but there are alternatives and if your seller won't work with you on this then you need to move on in your search. Recognize that the seller needs protected, too, but there are ways to do that. If necessary, open a bank account in a bank local to the seller, transfer the purchase price into that account with a wire transfer and have the seller drive you to that bank for their payment. Buying a car online presents a certain amount of physical danger, but if the seller knows that you have no cash on you (and make certain they are aware of that!) there is no longer a reason for violence. Don't carry cash. OK, you've finally bought your car and have possession. You still have to get it home, though, and that can be a problem. Any used car (or new ones!) can break down and it's best to assume that neither a dealer nor individual has given you the straight story on the reliability of any car. You will need insurance and at least a temporary tag or license. All of this must be taken care of before you leave, along with any motel reservations you might need. 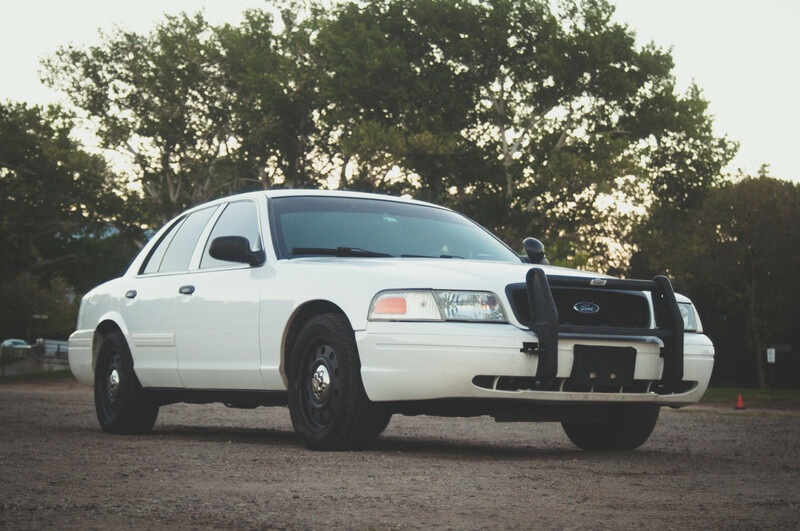 Dealers will provide you with a temporary permit to drive the car, but if you are buying from a private individual it is up to you to get that tag yourself. Know the laws of the state you are buying in before you ever leave home (can you buy a temporary tag on a weekend? ), and take care of insurance needs as well. You will need the VIN number as well as other information for your insurance agent. Because of the possibility of breakdown, make sure you have some emergency funds. A credit card that is not maxed out. A bank account with $1,000 left in it. Some way to obtain repairs without bankrupting yourself. You certainly hope you won't need it, but if you end up having to sell the car halfway home for nothing but bus fare it will not leave a pleasant memory so make sure you can supply repairs as needed. Trust me on this one - as a newlywed many years ago we had our car blow the engine 1,000 miles from home on New Years day and didn't even have bus fare left. It wasn't pleasant, to say the least, and if we hadn't found a very understanding and kindly used car dealer I might be there yet. Don't let it happen to you. As has been noted above, I have both sold and purchased several vehicles online and have helped my son with his own purchase. Most of my transactions have been through Craigslist with local buyers and sellers, but I have made 3 from long distance as well. This time it was once more through a dealership, which is my preferred method, and we have been extremely pleased. I spent a good deal of time both looking for a new RV and researching the vehicle and dealership we used and that gave me peace of mind if nothing else. Our transaction went very smoothly; any reputable dealer will have done this many times before and understand the ins and outs of the procedure as well as your legitimate concerns about buying a car online. 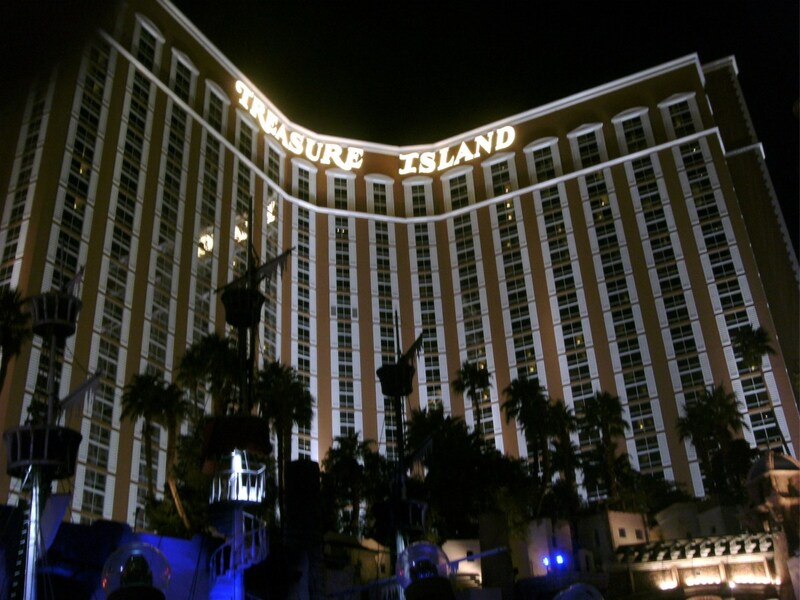 We had a hard two days drive ahead of us, from Phoenix to Boise, but chose instead to spend two nights at LasVegas and turn the two days into four. 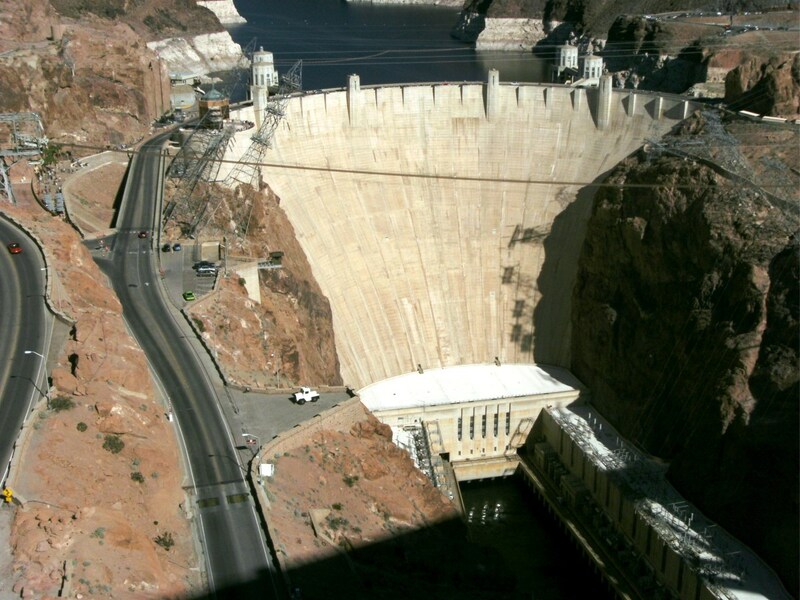 We got to stop at Hoover dam for some sightseeing as well, and the leisurely trip home kept us in good spirits all the way. I would certainly advise turning your trip home into a mini vacation if possible as it does make for a much more pleasant experience. All was not peaches and cream, however. Twenty miles short of the small town of Wells, Nevada we suddenly had huge clouds of smoke from the vehicle. Stopping immediately we determined that it was from fuel that was being sprayed all over the engine, but in the dark could not find the actual source. We were towed into Wells, where we spent the night in the parking lot of a repair shop and the next morning found that a rubber fuel line had come loose. A quick and easy fix, and we had a disconnected turbo charger line also repaired, but the cost including the tow was over $600. Thank goodness we had left home with an extra $1,000 available for emergencies - without it we might still be somewhere in Nevada. We had made sure that our insurance policy included towing insurance - something that can be invaluable when driving an unknown vehicle - and was certainly glad we had. 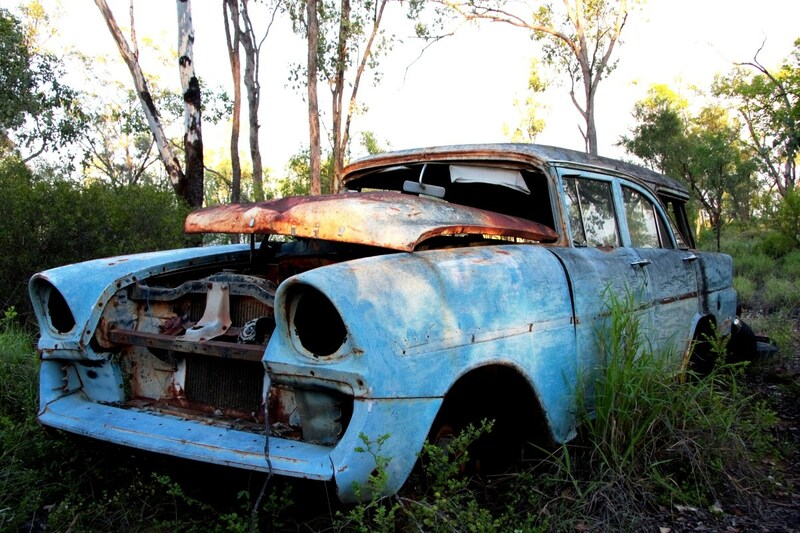 When buying any used car it is imperative that funds be readily available for repairs on the way home. If you have 20 miles to go, that's one thing, but when you must drive 1000 miles or more the possibility of breakdown must always be considered. 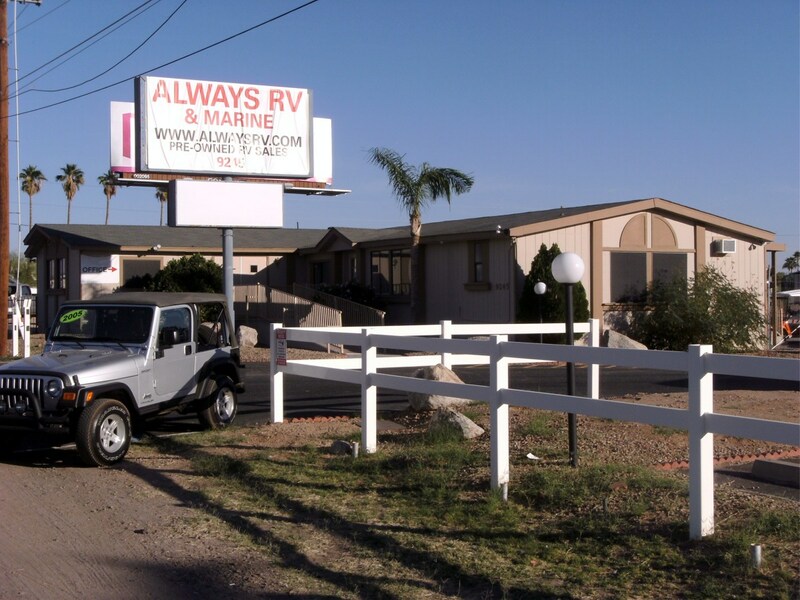 The dealer we bought from in Mesa, Arizona is called Always RV and Marine. Our experience, both before and after showing up to take possession, was very pleasant with but two complaints. Our airport transportation was on time and quickly got us to the sales lot. We were shown to our new RV and given a thorough walk through of everything it had to offer, followed by a test drive. During the drive I noted that the turbo boost gauge was showing nearly zero boost, but was told that was normal for the engine in question. We were to find later this was flatly untrue; the air hose controlling the turbo was disconnected and reconnection gave immediate turbo operation. During the walk through one of the cargo doors required considerable effort to open as the key did not seem to work properly. On closing it was the same thing in that the key did not work, but the technician finally got it closed and showed us it was locked by "tugging" on it. Later examination showed that the lock was broken and could not be closed with the key. We were asked to stay the night at one of three sites with hookups for RV's, which we did. This was intended to give us time to go through the RV and find any questions on operation or defects. 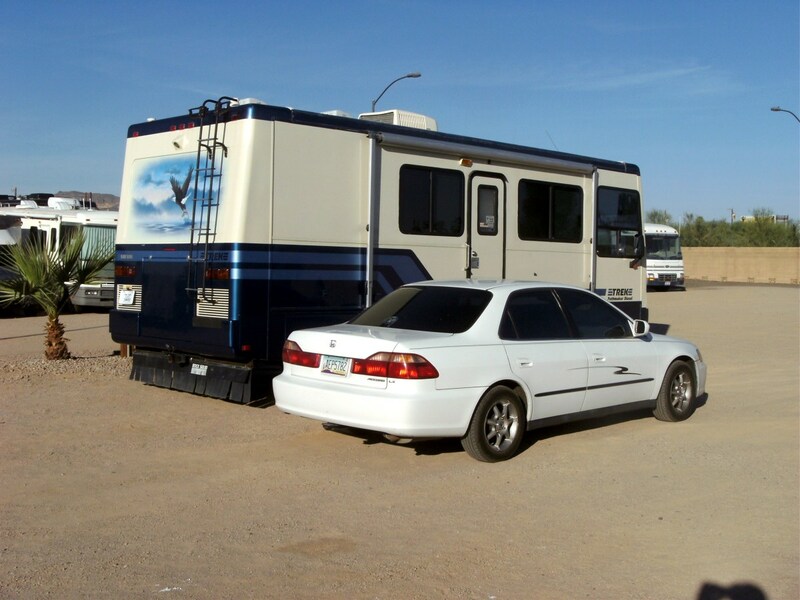 During the period we were also given a loaner car to drive around Mesa; we needed to purchase a little camping gear and groceries for the several days it would take to get home. The car was much easier to drive around a strange city in and was much appreciated. Paperwork was smooth and painless (except for parting with the cashiers check!) with no problems; Always RV has done this many times and is very familiar with dealing with out of state buyers. A piece of trim from the air conditioner is missing, but Always RV has it on order and will ship it as soon as it arrives. The couch was badly aged and dry rotted, with several good sized holes in the upholstery. This was not shown in the pictures at all even though there were several photos of the couch plainly showing the same area without the holes; the salesman was disturbed at this and offered us a $200 discount, which we accepted (we later bought a nearly new RV couch off of Craigslist for only $100 an installed it ourselves). Overall we had a very good experience at Always, and I would recommend them. I would suggest to Always that the information on the turbocharger and bay door lock is inexcusable. Any technician (or salesman) should have known that neither the turbo nor lock were operating properly and should have been upfront about it. The turbo was a 2 minute fix and although the lock will have to be special ordered it can also be ignored as there are two locks on that door. These two items are the only reason I only give Always RV a 4 star rating out of 5. Since this article was written I have purchased two more vehicles online, both through a Craigslist ad. The first was another used motorhome from a small dealer - we decided that we did not like the floor plan in the one in this article, sold it at a small profit and looked for another. This time we found a promising possibility near Spokane, Washington and asked my sister that lives nearby to take a look at it. 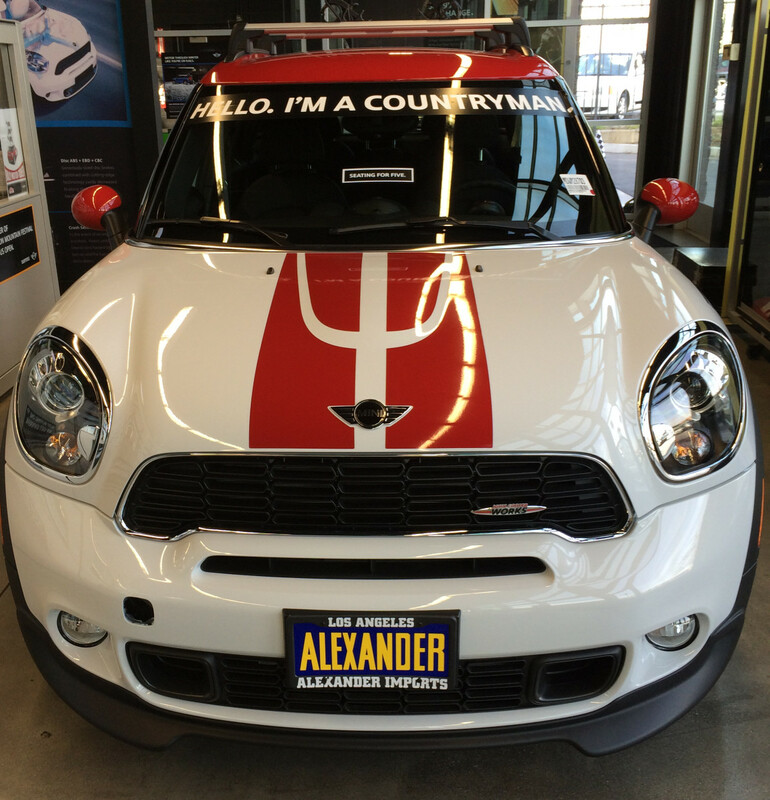 She reported that it was very good cosmetically and that her son-in-law thought it was in good shape mechanically. Worth a trip (and a visit with my sister), we drove up and ended up buying. Payment was again made through a Spokane branch of my bank, convenient and easy. The purchase was smooth and painless once more, but the trip home was again a problem when the shifter suddenly would move only with great effort. Stopping only once during the 400 mile drive I was able to get it home and found a bad shift cable to be the problem. Not the fault of the dealer; even out and on the workbench there was no visible defect and it was shifting fine until halfway home. Still, another example of a good reason to have some cash available for repairs. 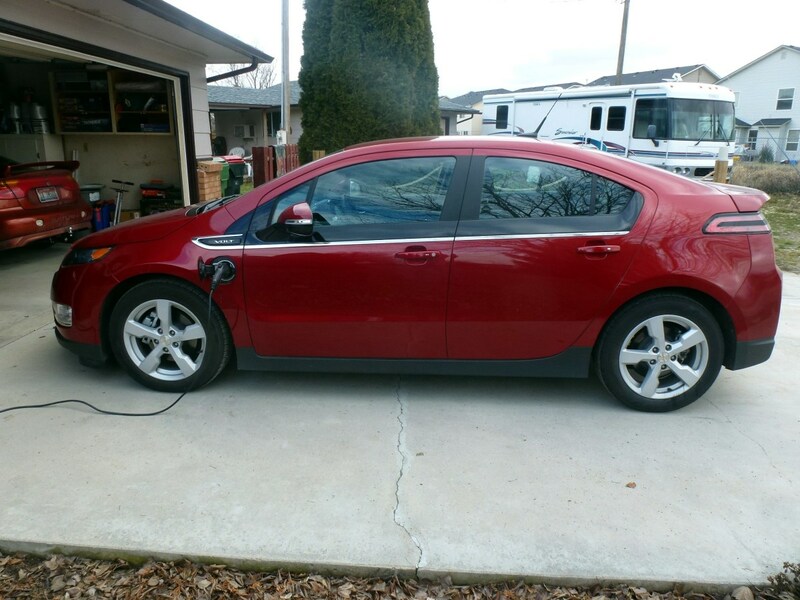 The second was a Chevrolet Volt that was advertised as new from Lithia Camp Chevrolet in Spokane. Lithia advertised it as "new" although it was not: Lithia had registered it and used it as a loaner for a few thousand miles. This caused confusion as I expected a new car rebate and couldn't get one, but price was eventually agreed on and we drove the 400 miles, expecting to trade in the car we drove up. This time I did not ask for an outside evaluation as the car was still virtually new and under factory warranty. The purchase went smoothly, the trade in was accepted with no trouble and we left with no problems. Payment was via GM financing arranged by Lithia. Lithia is a large company and there were no surprises during the purchase with one exception. Doing business near the state border with Idaho, Lithia is familiar with registration requirements and gave me a 3 day tag to get home. Unfortunately, I planned on being in the area at least that long and still having a two day drive to get home back through Washington, Oregon and finally Idaho - I finally made the drive home on an expired tag but could have purchased a more normal 30 day temporary tag if I felt it necessary. Or I could have registered it in northern Idaho where I was staying for those three days. We did have a little trouble with the salesman assigned to us as he was a little slow in getting back with information or responding to our offers, but it was not a big deal. During the purchase we spotted a couple of scratches on the "new" car and he promptly had them repaired, although we were asked to return in a couple of days for one of them as the body crew had gone home for the day - not a problem as we were staying a few days to visit the area anyway. The only real negative was that there was only one remote fob for the car; we were told that the second one had been ordered during our stay and would be programmed to our car VIN and promptly sent on when received. This didn't happen, and after two weeks I emailed the salesman and asked if there was a problem with it; the reply was that he didn't think so but would check and get right back to me. A week later we heard back that it was on order and should be in in a couple of days (I don't think it had been ordered at all) - that he would promptly ship it back out to me with a tracking number. That Saturday he emailed me and reported that he had it and would ship it on Monday, but we never heard from him again and never got a tracking number. On Wednesday, UPS indicated they had received it that day and I would have it Friday, and I did, but it was not programmed. The owners manual, however, had instructions on how to do that and I had no real trouble getting it to work on our new purchase. Overall, then, the Lithia purchase went smoothly but I felt that we were "forgotten" when it came time to continue customer service. I was on the verge of starting complaints up the line from the salesman, culminating in a small claims court (those remote fobs aren't cheap!) if necessary, but patience paid off and the deal was finally complete a month after delivery. 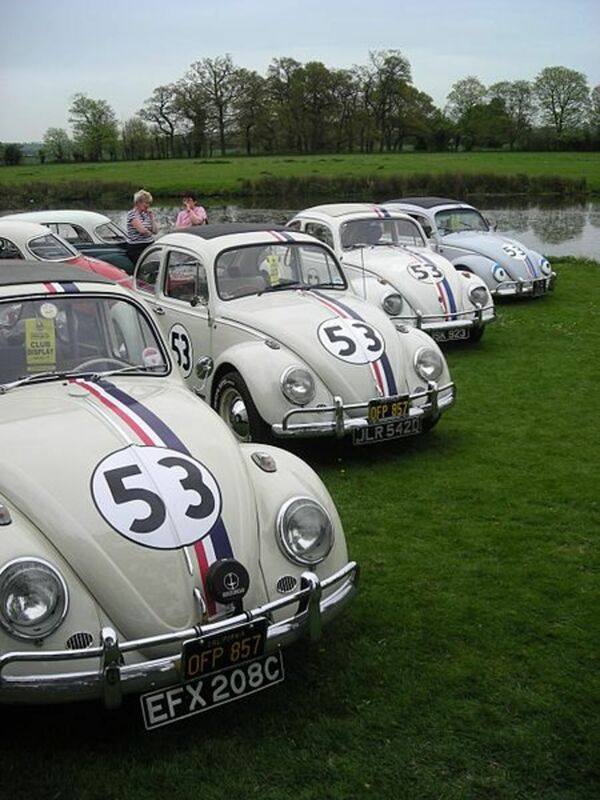 Great advice here Dan on your experience on any kind of motor vehicle online. Very insightful and useful, too. Voted up! Yes, Muscle, experience pays. That's why I wrote this - to pass some of that along to others so that they might make the same kind of errors. Plenty of nice tips! 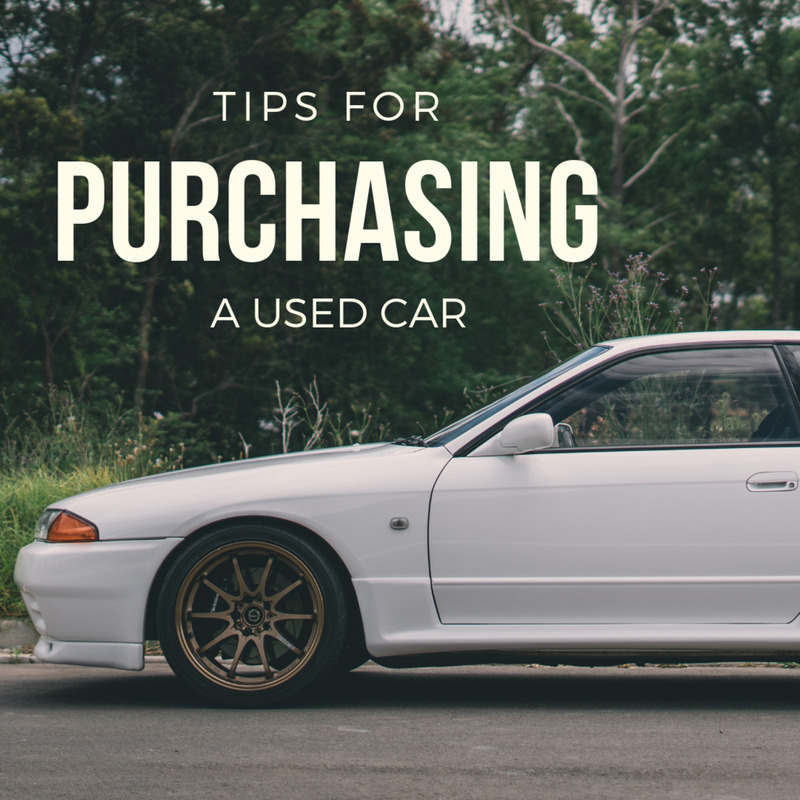 When I purchased my first car years ago, I made so many mistakes that I wish I didn't make. But these days, with hubs like this one, people can learn about what to do and not to do when purchasing a vehicle. That's why you gotta love the internet! Glad you found it useful, Ernie. I would buy from them again, with a little care on the mechanical end of an RV. Even recognizing that salesmen will sometimes be fully honest in their replies, the "information" about the turbocharger and bay door still irritates me. Neither was an expensive repair, but...I was lied to, and it was intentional. Very well written and informative. 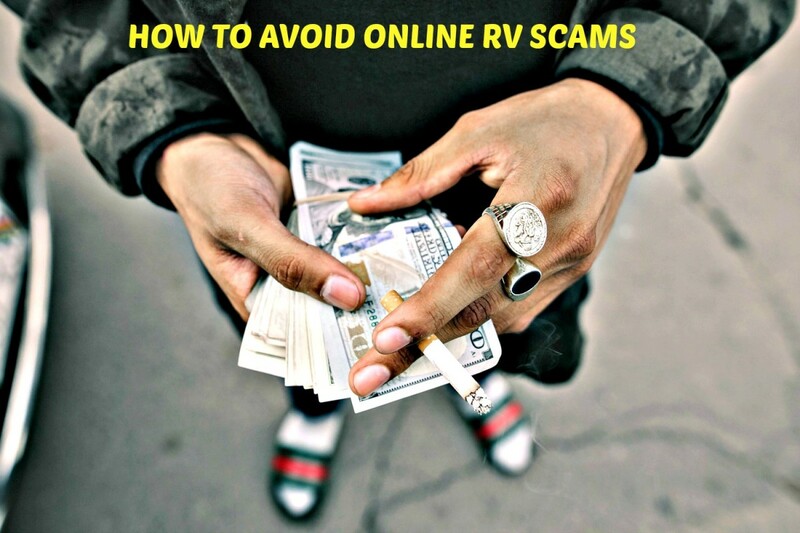 Thanks for all the scam info, and the dealer insight- they are locals for us so we may use them in our search for the right R.V. What an incredible story! Love it that you turned your experience into a vacation and that you had that extra $1,000 with you to get you home OK. Your thorough checking on 'Always' was helpful to read about and I'm sure many people will benefit for that tip and all the others you have here.